Electronic Arts today announced a deal with the developers of Shank and Deathspank to bring the downloadable games to multiple platforms. The publishing deals are part of agreements that Klei and Hothead Games recently signed with EA Partners. While no specific release dates have yet been announced, Shank will be coming to the PC, PS3 and Xbox 360 this summer, and the current deal includes bringing Deathspank to the PS3 and Xbox 360 in 2010. Both Deathspank and Shank were showcased at last year's Penny Arcade Expo and Shank is currently a finalist for "Excellence in Visual Art" at this year's Independent Games Festival. Taking place in a stylized, modern-Western setting, Shank tells a classic betrayal story directed through a sophisticated cinematic lens, with addictive action gameplay found in classic 2D side-scrolling games, according to EA. In Deathspank, designed by Ron Gilbert, players take on the role of DeathSpank, the Hero to the Downtrodden, a Vanquisher of Evil and Defender of Justice as he fulfills his life-long destiny and searches for a mysterious and magical item only known as "The Artifact", according to EA. Both deals were finalized under Jamil Moledina, Outreach Director, Business Development at EA Partners, and former executive director of the Game Developers Conference. "This is something we have been working on for a very long time," Moledina told Kotaku. "Our mission at EA Partners is to work with the best talent across the game industry, and we are thrilled to extend our expertise to the leading creative developers in downloadable indie games." "The opportunity at the indie development level is extraordinary. There is an opportunity in downloadable games in creativity and freedom to innovate because the don't have to sell a lot of units and can be more impulse purchase." 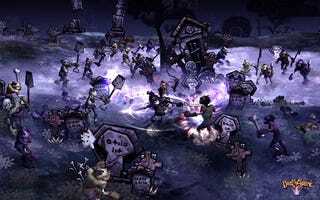 Shank developer Jamie Cheng, CEO of Klei Entertainment, said Shank was a work of passion, something that nearly didn't work out when last December a publisher they had lined up backed out. "We spent nine months creating this and the engine," Cheng said. "We showed it to the public. Demoed at PAX and I thought people would like it, but I had no idea people would love it the way they did." He said he was very happy with the deal to publish the game through EA Partners. "They allow us creative control on this game, they trust us to make the game we want to make and get them to a wide audience," he said. Ian Wilkinson, CEO of Hothead Games, said they decided to work with EA Partners on Deathspank because they "needed more traction" in the digital download space. "We want millions to play this game," Wilkinson said, "not a million." Both the deals and Electronic Arts decision to so aggressively expand into digital downloads by bringing big games to the space were, in part, made possible by last year's tremendous success with DICE's Battlefield 1943. EA CEO John Riccitiello told our Stephen Totilo at the time that the game's commercial and critical successes led to EA reexamining that market. Battlefield 1943 resulted in EA delivering a great game that was highly profitable and fun, he said. "We're learning from that and there will be more like that." Speaking with Kotaku yesterday, Moledina reaffirmed the game's impact on this renewed effort. "It played a role in building momentum for this," he said. "The success of Battlefield 1943 helped prove that you can field a triple-A product game in the impulse category and achieve extraordinary unit sales and do it with a great deal of passion." You just need to make sure you start with a great game, he added. And a good place to look for some of those great games include places like Penny Arcade Expo, Indicade and the IGF. While Moledina said he couldn't go into the details of these two latest deals, he did say that there is a desire for EA Partners to be able to publish more than just the single game from each studio.